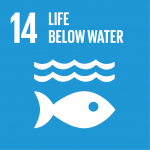 Blog Series: 1- Sustainable Development Goals (SDGs) Will You Help Build A Better World? 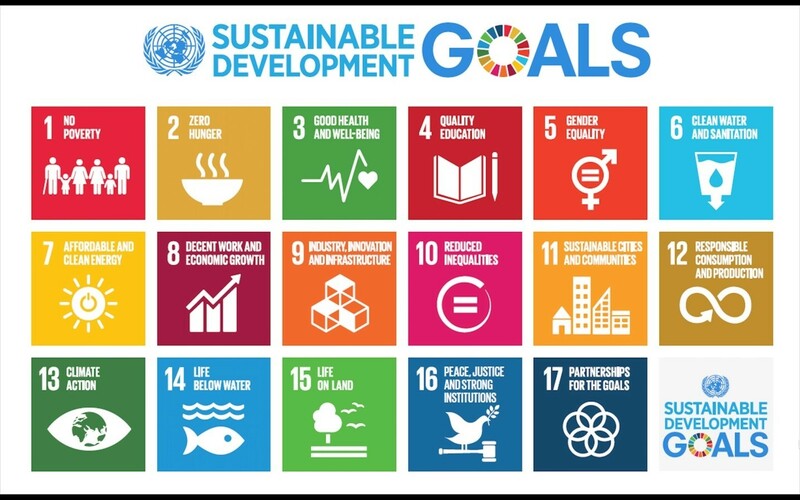 October 1, 2018 / Alexandra Hepple / Comments Off on Blog Series: 1- Sustainable Development Goals (SDGs) Will You Help Build A Better World? This week’s guest blog comes courtesy of Onna Malou van den Broek, a second year doctorate student at King’s in the European & International Studies Department. Onna’s doctorate project titled: ‘The Political Payoff of Corporate Social Responsibility (CSR): CSR as a Determinant for Lobbying Success’, looks at the relationship between corporate sustainability and lobbying, holding a special focus on the Sustainable Development Goals(SDGs). The views presented do not necessarily reflect those of King’s Sustainability. 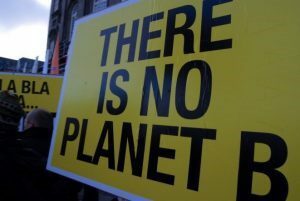 “This is no plan B because there is no planet B”, are the famous words of Ban Ki-moon, the former Secretary-General of the United Nations (UN). In 2015, the agenda for sustainable development was set by the UN member states. The Sustainable Development Goals (SDGs) is a collective action plan concerning sustainable social, economic, and ecological advancement for everyone. The aim is to leave no one behind. In this article, I will briefly introduce you to the goals in general. In the upcoming months I hope to familiarize you with each individual goal by writing seventeen separate articles on them. The SDGs take over the Millennium Development Goals (MDGs), which were effective from 2000 to 2015. The MDGs contributed to halving child mortality and lifting more than a billion people out of extreme poverty, to name but a few examples. Nevertheless, they did not tackle the root causes of underdevelopment. One of the reasons was that the MGDs Goals were only focused on developing countries and at providing developmental aid and assistance. The goals encompass broad social objectives targeted at governments but without measurement tools to evaluate process. The SDGs, on the other hand, target all countries and concern overall investments. They cover a combination of social, economic, and ecological goals targeted at the whole world population and with measurement mechanisms. The 17 goals cannot, and should not, be understood as separate entities; the success of one goal is closely related to the achievement of the other goals. The goals are broad and ambitious in their scope. For example, the first goal objective is that nobody should live in poverty by 2030 (“zero poverty”). Each goal is broken down in several targets. The overall 169 targets give the global goals more substance and depth. They specify the various aspects that constitute the goals and indicate when the goal is successfully achieved in 2030. 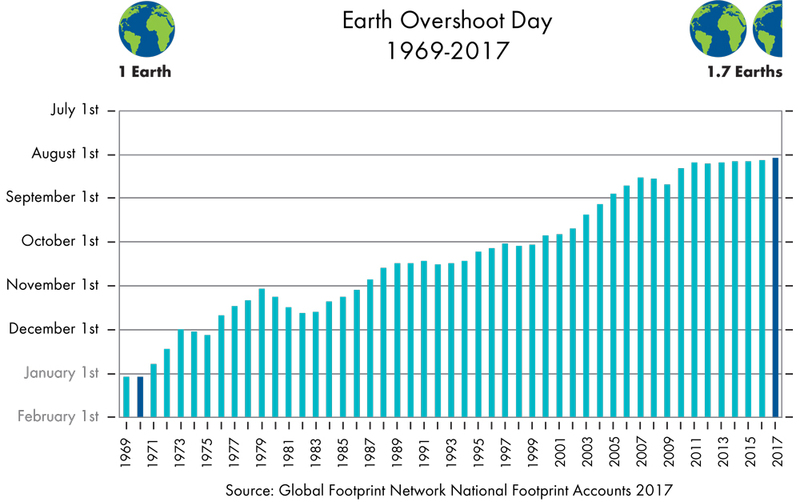 As an example, one of the targets that specifies the first goal refers to the fact that the amount of people in extreme poverty must be halved in 2030. One important improvement is that these targets can then be measured through accurate and dynamic data. The overall 232 indicators link existing datasets to the targets to facilitate the measurement, and evaluation, of progress. To measure is to know! Under the title “Global Goals”, several organisations around the world are organising events and actions to create awareness of the SDGs and to mobilise people to contribute to the accomplishment of the goals. These events are diverse and differ in scale. Worldwide, there are various events around the subject how to make the SDGs “local business”. In the UK context, the UN Global Compact Network UK organizes the SDG Roadshow, which focuses on how businesses can align their strategies with the SDGs (1). Furthermore, in London Fashion United, a leading fashion trade event, has recently launched the “Power of One”. Through this campaign they aim to raise awareness for the Global Goals and in particularly for ethical and sustainable fashion. The Sustainable Development Goals are also for you! What encompasses these 17 goals precisely? How are we progressing? Who contributes towards their achievement? What can I do? During an internship for the United Nations in 2016, I was responsible to find answer to these questions and communicate them to various people. I observed that although everyone is convinced of the importance of the SDGs, they often get stuck in the web of goals, targets and indicators. Meanwhile, I have started working on my PhD at King’s College London and have noticed that there is quite a bit of uncertainty on the SDGs amongst students. To contribute to a better world, I want to make the SDGs more concrete and accessible for you. To do so, I will write an article about every goal in which I explain what the specific goal means and sketch the current situation. I will give examples of initiatives addressing the specific goal and suggests ways for you to contribute as well. Will you help to build a better world? Want to know more on the SDG roadshow? You can visit their website here. You can read more on the Power of One here. Until Sunday, the 11th June, Thames Plastic are taking over the Somerset House River Terrace with their Thames Plastic Lab. Over the last year, King’s artist in residence Maria Arceo and a group of volunteers (including Thames21, King’s staff, and students during our Sustainability Week) have collected plastic from the beaches of the Thames. They have then spent a few weeks at Canada Water, washing the plastic so it can be used. Now, the project has reached the next stage: sorting it by colour so it can be used in an art installation as part of the Thames Festival. The Thames Plastic Lab is a collaboration between King’s College London’s Departments of Chemistry and Geography, the Royal Society of Chemistry and artist Maria Arceo, supported by the Cultural Institute at King’s. Throughout this week, they are inviting the public to come along and learn what kind of plastic ends up in the Thames, how it gets there, and what you can do. You can also pick a piece of plastic and ask for it to be analysed! In the end, all the plastic from the workshops will be turned into an art installation to raise awareness for the problem of plastic pollution in our rivers and oceans. The Plastic Lab has been a great success so far, you can see pictures of the event on Twitter. 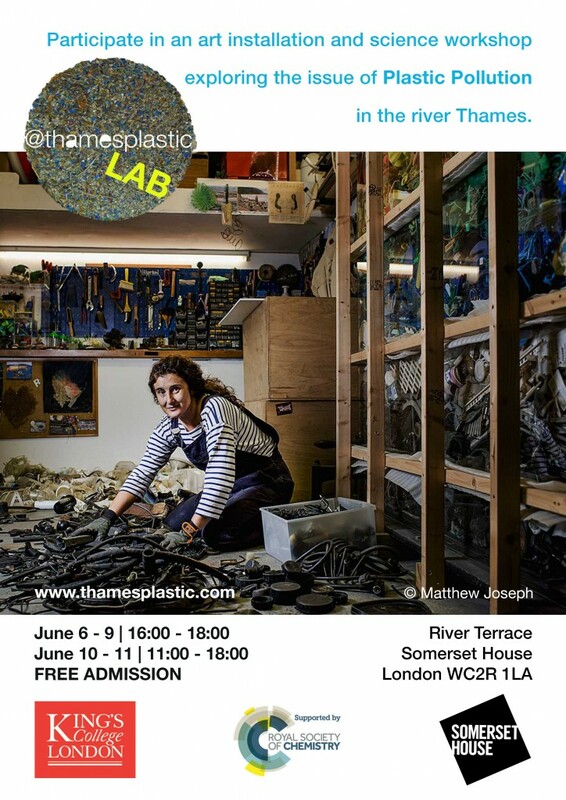 The Thames Plastic Lab will remain open until the 11th June. More information can be found here. Make sure to drop in! Our neighbours from Hubbub are currently also running their own campaign to combat plastic waste in the Thames. 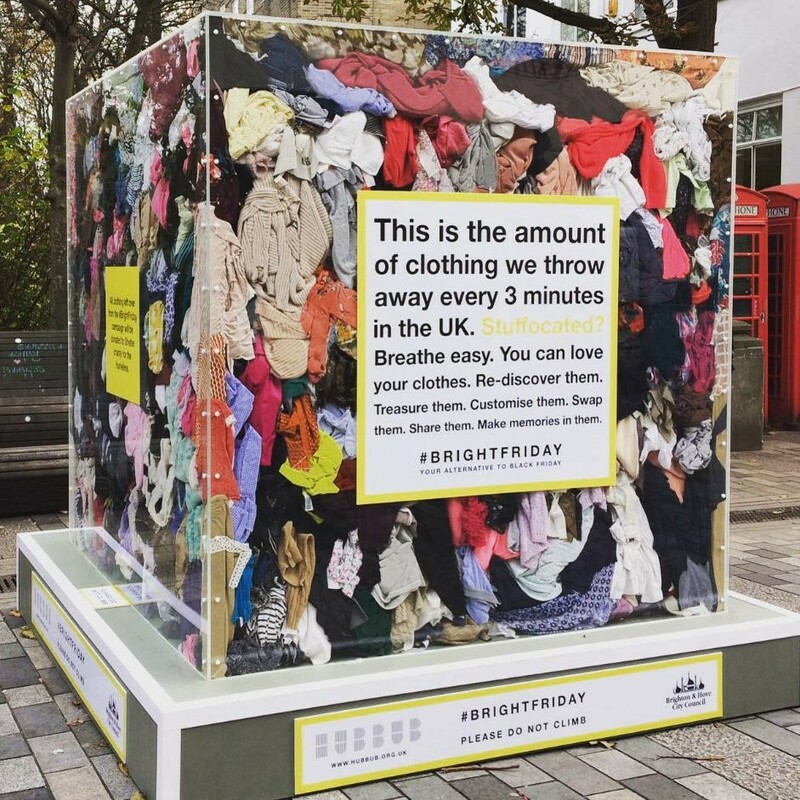 With #FFSLDN (For Fish’s Sake London, don’t drop litter! ), they are trying to engage Londoners in a conversation about our littering habits. For example, do you know what tidy littering is? It’s leaving your rubbish next to a bin, on top of an overflowing bin, or on a wall or ledge. It might seem innocent, but rubbish often falls off, gets blown away, and ultimately ends up in our great river. 300 tonnes of litter are cleared from the Thames every year – showing how important things like the Thames Plastic project are. Ultimately, plastic pollution becomes a very real problem for people. It is estimated that 70% of fish in the Thames have plastic in their guts, and plastic increasingly makes its way into our diets through fish that have swallowed small pieces of plastic. So next time you drop a piece of plastic, make sure it’s in a recycling bin! June 5, 2017 / Martin Gulliford / Comments Off on Big recycling news! If you have looked at the bins at King’s recently, you might have noticed our new recycling guides. 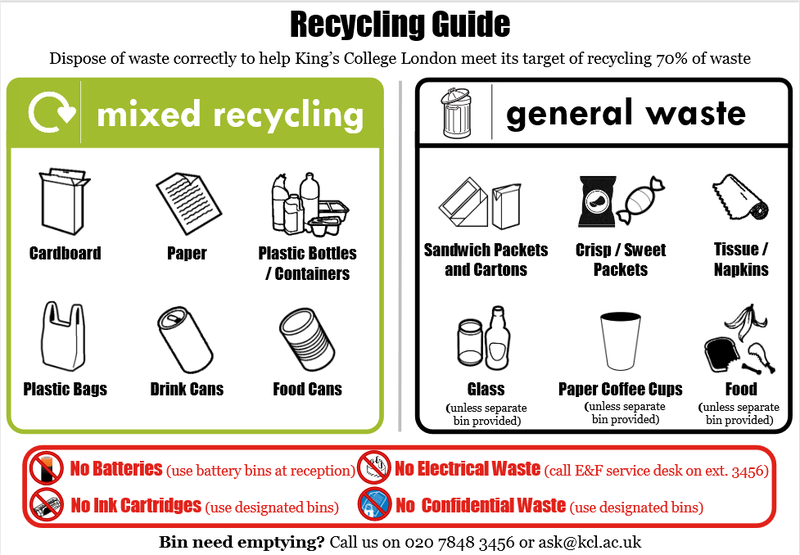 King’s is committed to achieving a recycling rate of 70%, and our new recycling guidelines are a small part of the wider changes that have been happening behind the scenes in the last months. Throughout this summer, our new waste contractor Simply Waste Solutions will start collections at all campuses, beginning with Denmark Hill this week. Simply Waste Solutions will replace several current contractors, and help us deliver a more consistent service across King’s. This means no more differences in what can/cannot be recycled depending on campus! In addition to the new bin signage, we have created a Waste A-Z to help make recycling as easy as possible. 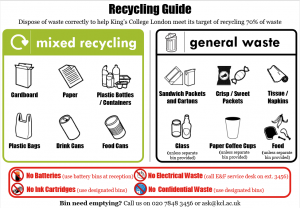 This guide can be found at internal.kcl.ac.uk/recycling. If you would like to see additional resources, or have questions about other waste types, please let us know! Our contract with Simply Waste Solutions means we will now be able to tackle more waste streams. One of these is food waste, which is currently only separated at Strand. With the new contract, King’s Food will separate their kitchen waste at all campuses, and send the waste to anaerobic digestion. In addition to this, we will be able to extend our coffee cup recycling programme to more campuses. The Maughan Library already has this programme in place as a result of taking part in the Square Mile Challenge, and other campuses can expect to see coffee cup bins pop up in the next months. Usually, only 1% of disposable coffee cups in the UK are recycled. With the Simply Cups programme, we can collect cups and Simply Cups will turn them into new products. So don’t be surprised if your coffee cup makes its way back to King’s looking very different (e.g. a canteen tray or pen). So, what happens to our waste? As long as it is not contaminated, everything in our recycling bins will be given a second life. Paying attention to the recycling guidelines is important, as recycling bags may be classed as “contaminated” if they contain non-recyclable waste. 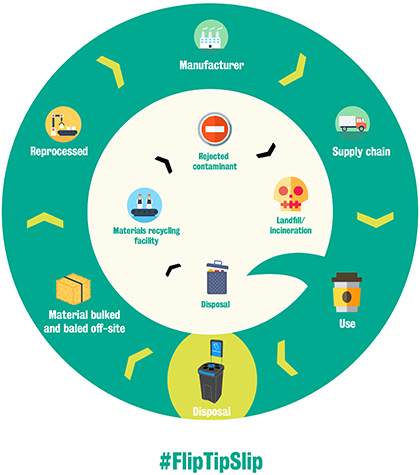 Contaminated bags may end up being rejected, so it is important to pay attention to what goes in the bin. A common doubt regarding recycling is how clean items like plastic pots should be when going in the recycling bin. Things like yoghurt pots and plastic bottles should be empty and not contain any food or liquids, but they don’t need to be spotlessly clean. A rule of thumb is that if you would happily stick your hand in the recycling bin after binning your item, and it could come out clean and dry, it’s good to go in recycling. Our food waste goes to anaerobic digestion. This means that it will be put into sealed containers and broken down by natural micro-organisms. At the end of this progress, two products remain: biogas, to be used as fuel to generate renewable energy; and a nutrient-rich digestate, used as fertiliser. Glass waste is sent to plants where it can be washed and sorted into colours. It is then melted and moulded into new products. As glass does not degrade through the recycling process, as paper fibres do, it can be used again and again! The remaining general waste is not sent to landfill, but incinerated in energy-from-waste plants. The created heat is used to generate electricity (fed into the National Grid) and to heat homes. The remaining ash is collected and used as a material for road construction. 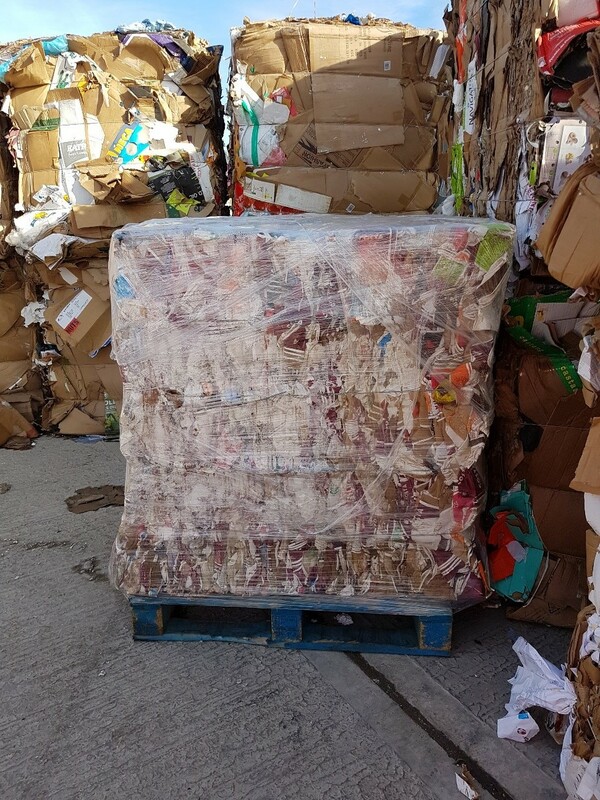 This means that with Simply Waste Solutions, we are able to send zero waste to landfill for all of our general, bulky and food waste. Fun fact: On a recent visit, we met Simply Waste Solutions’ very own chief mouser – a former stray who just turned up and moved in one day. Here he is, roaming the waste yard and making sure everyone recycles properly. Don’t buy it – Warp It! April 26, 2017 / Martin Gulliford / Comments Off on Don’t buy it – Warp It! 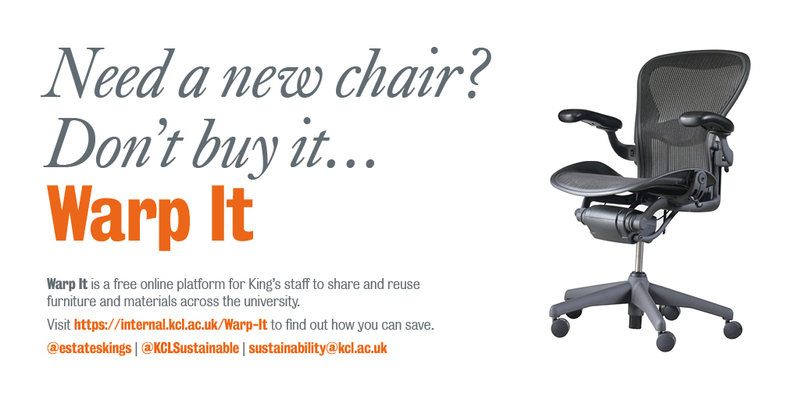 Last week, King’s re-launched the reuse platform Warp It. 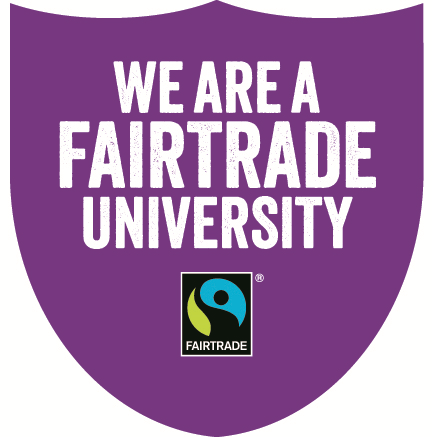 Originally opened to staff in 2016, Warp It works like a university-wide Freecycle. Staff can add unwanted furniture, research equipment and more to the online portal. Users can then claim these items for free. This means unwanted, good quality furniture is no longer thrown away. Instead, it is given a new life somewhere else in the university, reducing waste and saving money. At the moment, Warp It is only open to staff. If you are interested in signing up and start reusing furniture, please visit the internal Warp It pages.